Abstract. Several technical and nontechnical improvements in peritoneal dialysis (PD) have occurred during recent years. Since few previous studies have examined trends in PD mortality over time, and to determine whether enhancements in PD have translated into improved patient outcomes, mortality rates among the 17,900 patients receiving PD in Canada during the period 1981-1997 were analyzed. Mortality rate ratios (RR) were estimated using Poisson regression, adjusting for age, race, gender, primary renal diagnosis, follow-up time, and type of PD (continuous ambulatory/cyclic versus intermittent). Adjusted mortality rates decreased significantly by calender period, the reduction being monotonic: RR = 0.81, 95% confidence interval [CI], 0.75 to 0.87 for 1986-1989; RR = 0.73, 95% CI, 0.67 to 0.78 for 1990-1993; RR = 0.63, 95% CI, 0.58 to 0.67 for 1994-1997, with 1981-1985 serving as the reference period (RR = 1, fixed). The improvement in mortality was fairly consistent across patient subpopulations. When analyzed separately by follow-up time window, the mortality decrease was strongest in the first 12 mo after renal replacement therapy initiation. Supplementary analysis revealed that the trend in mortality rates was not attributable to corresponding trends in transplantation or technique failure rates, or modality switching patterns. Results were quite similar whether based on an “as-treated” or “intent-to-treat” analysis. More extensive data on practice patterns would empower future studies to elucidate the cause/effect relationship between PD practice patterns and patient survival. Peritoneal dialysis (PD) has now been established for more than 20 yr as a form of renal replacement therapy. Chronic PD grew in popularity as a form of renal replacement therapy (RRT) after the development of ambulatory forms of this technique by Popovich et al. (1,2) and Oreopoulos et al. (3). In the mid-1990s, it was estimated that nearly 70,000 patients with end-stage renal disease (ESRD) worldwide were receiving PD (4,5). Since its inception, there have been several major technical and nontechnical advances in PD, and the therapy continues to evolve. As well, a more complete understanding of the benefits and limitations associated with PD has been achieved (6,7,8,9). The majority of published articles on PD mortality involved comparisons to hemodialysis (HD) (10,11,12). Most of these national and multicenter studies were restricted to a relatively narrow time frame. Since there is a dearth of information on PD mortality patterns over time, we examined trends in mortality on PD during the 1981-1996 calender period in an attempt to assess the effect of improvements in PD on patient outcomes. Data were obtained from the Canadian Organ Replacement Register (CORR) of the Canadian Institute for Health Information, a population-based, nationwide organ failure registry (13). Baseline demographic data are collected by each of the 86 renal centers from all patients at RRT initiation, including date of birth, gender, province of residence, race, predialysis comorbid conditions, and primary renal diagnosis (PRD). Clinical history data are submitted annually by each center, including dialytic modality assignments and switches, transplantations, and graft failures. Mortality information is reported along with the other follow-up data. Data were available on all patients initiating therapy between January 1, 1981, and December 31, 1997. Each patient's follow-up time on PD was computed. The study population consisted of the 17,900 patients who received PD between January 1, 1981, and December 31, 1997, the start and conclusion of the period of observation, respectively. Patients were classified by gender, PRD, and race (black, Caucasian, North American Indian, Oriental, Asian-Indian, and other/unknown). Person-years (PY) of follow-up among patients receiving PD were classified by age (≤14, 15 to 44, 45 to 64, 65 to 74, ≥75), calender period (1981-1985, 1986-1989, 1990-1993, 1994-1997), follow-up time (1-yr intervals), and type of PD (continuous ambulatory/cyclic PD [CAPD/CCPD] versus intermittent PD). Naturally, age, calendar time, follow-up interval, and PD type were dynamic variables in that patients could contribute PY to more than one category as they progressed through the period of observation. An “as-treated” (AT) analysis was performed in which deaths were attributed to the dialytic modality received at the time of death. Mortality rates were computed as the ratio of deaths to person-time. Poisson regression (14,15) was used to compare mortality rates among the calendar periods while adjusting for age, gender, race, PRD, follow-up interval, and type of PD. That is, the logarithm (base e) of the mortality rate was modeled as a linear function of parameters representing each variable. The mortality rate ratio (RR, i.e., death rate for each calender period, relative to the arbitrarily chosen reference period: 1981-1985) served as the parameter of interest. Results from the Poisson regression models were used to generate fitted survival curves by calendar period for “referent” PD patients (i.e., patients at the referent level for each category: specifically, Caucasian women ages 45 to 64 receiving CAPD/CCPD, with glomerulonephritis as a PRD). To further assess the trend in mortality rates, a model was fitted that used eight calender periods (reference: 1981-1983, with 2-yr intervals thereafter). Another model was also fitted with calender year entered as a continuous variable, wherein the average change in RR per year was estimated under the implicit assumption of a constant rate of change throughout the observation period. Although a “constant-RR” model would not be expected to fit the data precisely, it provides a useful summary measure of the mortality trend. Separate models were fitted by age and diabetes status to examine the consistency of the trend in adjusted mortality rates across subpopulations. Follow-up time window-specific models were also fitted. In terms of supplementary analysis, Poisson regression models were fitted to transplantation and technique failure rates. In the computation of transplant rates, only first renal transplants were considered. A technique failure was considered any switch from PD to HD. For the purposes of computing both transplant and technique failure rates, patients were censored at the date of transplantation. The purpose of the PD transfer rate models was to assess the degree of correlation between observed trends in PD mortality rates and rates of transfer from PD, to ensure that the former was not an artifact due to the latter. To further assess the impact of modality switches on the RR values, we fitted models in which deaths occurring within 90 d of a modality switch from PD to HD were attributed to PD. Intent-to-treat (ITT) models were fitted using Cox regression (16), in which patients were classified by modality that was received 90 d post-RRT initiation, with subsequent modality switches ignored in the analysis. That is, in the ITT analysis, modality is treated as a static variable, with deaths attributed to the RRT received on follow-up day 90, as opposed to that received at the time of death. Naturally, since classification is based on day 90, patients dying or transplanted during days 0 to 89 post-RRT initiation are excluded. The ITT models were fitted to further assess the dependence of our findings on the statistical methods originally chosen. Cause-of-death (COD)-specific Poisson regression models were fitted to assess the degree of mortality trend by COD, to assist in reconciling observed trends in all-cause mortality. In Table 1, baseline demographic and clinical characteristics are listed for the 17,900 patients who initiated PD during the period of observation. Approximately 37% of patients were in the 45 to 64 age group upon PD initiation, while about 36% were ≥65 yr of age. Approximately 44% of patients who received PD were women. The majority of patients were Caucasian (80%), and the next most common race was Orientals, who comprised 5% of the study population. Approximately 20% of patients initiated PD during the 1981-1985 period, while 31% began between 1994 and 1997. Among those initiating PD, 28% had diabetes as a PRD. Trends over calendar time with respect to patient characteristics are presented in Table 2. The percentage of patients ≥65 yr of age at initiation of PD rose from 29% during the 1981-1985 period to 39% for 1994-1997, while the mean age at initiation increased from 52.1 to 56.4. The percentage of PD patients with diabetes as a PRD increased from 22 to 31% during the 1981-1985 and 1994-1997 calendar periods, respectively, while the fraction of patients with glomerulonephritis decreased from 20 to 14%. Calendar period-specific unadjusted mortality rates, as well as unadjusted and covariable-adjusted mortality rate ratios, are presented in Table 3. The unadjusted mortality rate was 184.8 per 1000 PY during 1981-1997, and decreased steadily, as evidenced by the trend in the unadjusted RR values. Much stronger trends were observed in adjusted mortality. Relative to the 1981-1985 calendar period, significant reductions in adjusted mortality rates were observed during the 1986-1989, 1990-1993, and 1994-1997 periods. For example, mortality on PD during the 1994-1997 period was 63% of that experienced during 1981-1985, adjusting for age, gender, race, PRD, and follow-up time. The RR values decreased monotonically with calendar time, each successive period experiencing a lower mortality than the previous period. The greatest marginal reduction in mortality, when comparing consecutive calendar time intervals, occurred for the 1986-1989 period. Further assessment of the dose—response relationship between calendar time and PD mortality is displayed in Figure 1. Here, regression models similar to those in Table 3 were fitted, except that subsequent to the reference period (1981-1983), 2-yr calendar periods were used. The RR values and 95% confidence intervals (CI) are plotted against the midpoint of the calendar period to which they correspond. The trend in the RR values indicates steadily decreasing mortality. There appears to be a plateau in the mortality decline between 1990 and 1993, but further decreases occur during the 1994-1995 and 1996-1997 periods. Superimposed over the calendar time period-specific RR values is the estimated RR (without CI) based on a model-containing year as a continuous variable. On the basis of this model, which implicitly assumes a constant mortality reduction, it is estimated that mortality decreases by 4% annually (i.e., RR = 0.96 per year, relative to 1981-1983) between 1984 and 1997. The fitted RR values from this latter model appear to summarize the calendar time window-specific RR values adequately. Mortality rate ratios (RR) and 95% confidence intervals (CI) for Canadian peritoneal dialysis (PD) patients. Calendar time was divided into eight subintervals: the 1981-1983 period serving as the reference (RR = 1, fixed), with the remainder of the period of observation divided into 2-yr subintervals. RR values are plotted against the midpoint of the calendar time interval to which they correspond. RR values were estimated using Poisson regression, and adjusted for age, gender, race, primary renal diagnosis, follow-up time, and type of PD (i.e., continuous ambulatory/cyclic PD [CAPD/CCPD], intermittent PD [IPD]). The gray unmarked line is based on a model with calendar year as a continuous variable, and assumes a constant annual decrease in log mortality throughout the period of observation (RR = 0.95 per year beyond 1983). Mortality rate ratios for patient subpopulations defined by age and diabetes status are presented in Table 4. The reduction in mortality was significant for each calendar period within each subgroup, with the exception of diabetic patients ≥65 yr of age from 1986-1989. Within each subgroup, mortality for any calendar period was lower than the previous period. Generally, the improvement in mortality was quite consistent across patient subgroups. In Figure 2, PD mortality trends are examined by follow-up time window. The improvement in mortality appears to be strongest during months 0 to 12 after RRT initiation (top left panel), attaining statistical significance for each calendar period subsequent to 1981-1985, and demonstrating little evidence of a plateau. 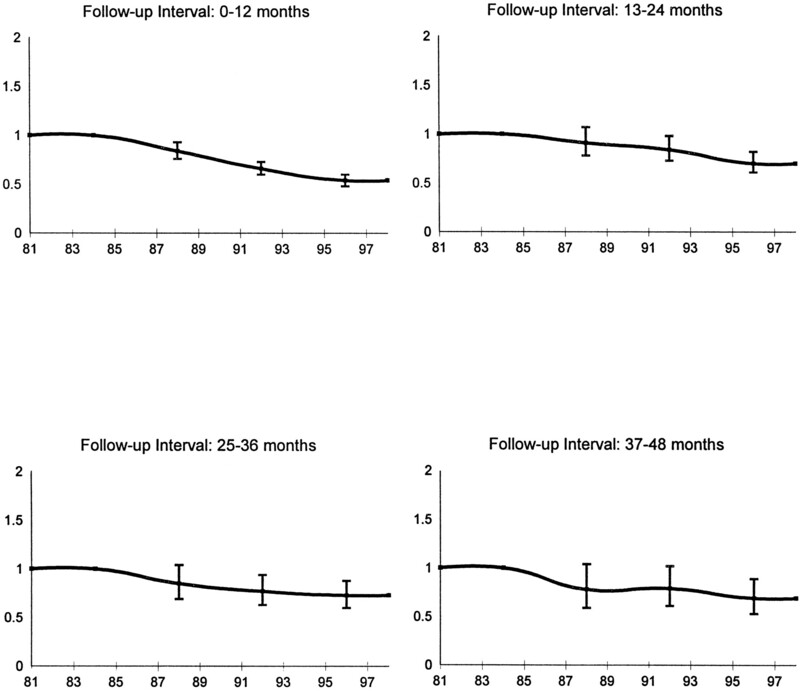 The effect weakens slightly for follow-up months 13 to 24 (top right). Although statistical significance is still attained for the last two calendar periods, the year 2 RR values are of lesser magnitude. The mortality decrease is of similar magnitude for the years 2, 3 (bottom left), and 4 (bottom right) of follow-up, although statistical power is progressively reduced, as reflected by the width of the CI. Mortality RR and 95% CI for Canadian PD patients by follow-up time interval. Calendar time was divided into four subintervals, with the 1981-1985 period serving as the reference (RR = 1, fixed). RR values are plotted against the midpoint of the calendar time interval to which they correspond. RR values were estimated using Poisson regression, and adjusted for age, gender, race, primary renal diagnosis, and type of PD (i.e., CAPD/CCPD, IPD). Each panel pertains to a separate follow-up time window. Fitted survival curves by calendar period, based on the RR values in Figure 2, are displayed in Figure 3. Each curve pertains to “referent” patients: female Caucasians ages 45 to 64 receiving CAPD/CCPD, with glomerulonephritis as a PRD. It is estimated that 4-yr survival probability increased from 60% in 1981-1985 to 71% during 1994-1997, after adjusting for all covariables incorporating nonuniformity in the RR values by follow-up interval. Fitted survival probability for Canadian PD patients by calendar period. Data presented are for reference category patients (i.e., female, Caucasian CAPD/CCPD patients ages 45 to 64 with glomerulonephritis as a primary renal diagnosis) based on RR values displayed in Figure 2. Cause-specific mortality is examined in Table 5. The most frequently recorded COD among PD patients was cardiovascular disease (CVD), to which approximately 37% of total deaths were attributable. Social cases (e.g., suicide, refusal of therapy) were the next most common COD at 13%, followed by infection (8%, excluding peritonitis). Peritonitis was responsible for 3% of deaths. CVD mortality was not significantly reduced during 1986-1989, with RR = 0.95 (95% CI, 0.86 to 1.05) relative to 1981-1985. However, marked and significant reductions in CVD mortality were observed during 1990-1993 (RR = 0.76) and 1994-1997 (RR = 0.63). The sharpest reduction was in peritonitis-attributable mortality, with RR = 0.31 (95% CI, 0.26 to 0.36) for the 1994-1997 period relative to 1981-1985. Listed in Table 6 are covariable-adjusted transplant and technique failure rate ratios by calendar period among PD patients. Transplant rates from PD were significantly elevated during the 1986-1989 and 1990-1993 periods relative to 1981-1985. Technique failure rates for PD were significantly decreased for the 1990-1993 period (RR = 0.88), although RR ≈ 1 for 1986-1989 and 1994-1997. Furthermore, with regard to RRT switching, note that RR values were virtually identical when deaths occurring within 90 d of a “PD→HD” modality switch were attributed back to PD (data not shown). As shown in Table 7, results based on the ITT models were very similar to those based on the AT analysis (Table 3) in terms of the magnitude of the RR values over calendar time. The RR, values reduce monotonically for both the AT (RR = 1, 0.81, 0.73, 0.63) and ITT (RR = 1, 0.85, 0.74, 0.64) analyses, the reduction attaining statistical significance within each time period post-1985. Great declines in mortality over calendar time were experienced during the 1981-1997 period among patients receiving continuous peritoneal dialysis in Canada. Adjusted PD mortality rates were significantly reduced during the 1986-1989, 1990-1993, and 1994-1997 periods relative to 1981-1985. The mortality decrease was quite uniform across patient subgroups and was strongest in the first year of follow-up after RRT initiation. Few investigations have explicitly evaluated calendar time trends in mortality rates by dialytic modality. Published data indicate that improvements in PD mortality are not confined to Canada, as Moran recently reported strong declines in PD death rates between 1987 and 1993 based on U.S. Renal Data Study data (17). Nor are decreases in mortality on dialysis limited to PD. Port et al. observed improved survival among U.S. HD patients between 1986 and 1997 (18). Schaubel and Fenton observed declines in mortality among Canadian HD patients (19), although the strength of the decline was far exceeded by that observed among PD patients in the current study. Our study featured data from a nationwide, population-based organ failure registry. Follow-up was complete in that no time on dialysis after RRT initiation was excluded. Dates of treatment modality switches were known, enabling accurate delineation of person-time and deaths by modality. Because of the size of the study population (n = 17,900) and length of the observation period (17 yr), ample statistical power was available to discern meaningful mortality trends. Limitations of our study are typical of those using registry databases. Ward and Brier recently provided a detailed discussion of the liabilities of large medical databases (20). Although coverage by CORR is complete in that all 86 Canadian renal centers participate, data are submitted on a voluntary basis. Moreover, the database has never been validated. However, these factors pose no major threat to the validity to our findings, since it is doubtful that incompleteness of death reporting was frequent, and even less likely that the degree of nonreporting varied systematically over calendar time. It is highly improbable that the improvement in PD mortality is an artifact due to differences in the covariable distribution over time. Using Poisson regression, RR values were adjusted for age, gender, race, primary renal diagnosis, follow-up time, and PD method. We did not adjust for comorbidity since comorbidity data were only available for patients who initiated therapy between 1988 and 1997. However, since RRT initiation rates in Canada increased greatly during the period of observation (13,21), it is likely that the overall health of patients initiating PD progressively worsened between 1981 and 1997. Although our ability to evaluate this is far from complete, we showed that based on the calendar period-specific age and PRD distributions, patient characteristics became less favorable as calendar time progressed. Hence, it is likely that the calendar period RR values would have further decreased, indicating even greater PD mortality improvement, had comorbidity data been available for all years during the observation period. It was hypothesized that the reduction in patient PD mortality could have resulted from simultaneous changes in rates of transplantation and/or technique failure, analogous to the concept of “competing mortality” in the evaluation of cause-specific mortality (22). That is, as calendar time progressed, patients could be removed from the risk set in such a way that PD death rates are artificially decreased (i.e., spurious reduction in death rates due to patient withdrawal from the risk set, rather than there being fewer deaths among patients remaining in the risk set). In theory, the decline in PD mortality rates over calendar time could have resulted from decreased transplantation rates. The reduction in the number of available donor kidneys for transplantation, and the corresponding increase in the number of wait-listed patients, has been well-documented, particularly in Canada (13). Patients who were sufficiently healthy to receive a kidney transplant during the 1981-1985 period may have been left on dialysis during subsequent calendar periods due to the lack of organ availability. This in turn would result in a healthier dialysis patient risk, particularly PD, which appears to have a healthier case-mix than HD in Canada (12). Thus, if the patient distribution was progressively healthier over the period of observation, beyond that reflected by co-variables for which adjustment is already made, a mortality decrease would ensue. Evidence in favor of this hypothesis would, at a minimum, require that covariable-adjusted transplant RR values decrease monotonically with calendar time. However, not only did the transplant RR values fail to steadily decrease, they were significantly elevated during the 1986-1989 and 1990-1993 periods relative to 1981-1985. In fact, during the calendar period in which the greatest marginal reduction (i.e., comparing consecutive calendar periods) in PD morality rates was observed (1986-1989), transplantation rates were significantly increased (RR = 1.30). Even though transplantation rates were decreased in 1990-1993 (RR = 1.13) compared with 1986-1989, PD mortality still decreased during 1990-1993 relative to 1986-1989. Thus, analysis of the calendar period-specific renal transplantation rates offers no evidence consistent with the hypothesis of artificially reduced PD due to time trends in transplant rates. Mortality rates for PD could have been artificially reduced due to increased technique failure rates. That is, patients who during 1981-1985 would have remained on PD and eventually die may have been switched to HD at an increasing rate during subsequent calendar periods. Deaths actually attributable to PD would be counted against HD due to an increased propensity for modality switching. As discussed by previous authors (23,24), the AT method of analysis is more susceptible to this type of bias that the ITT analysis. The AT analysis attributes deaths to the modality received at the time of death, whereas the ITT analysis classifies deaths based on RRT received at some arbitrarily selected lag time after RRT initiation, regardless of subsequent modality switching history. Although the “AT versus ITT” debate has been discussed primarily in the context of mortality comparisons between PD and HD, it is relevant here even though HD death rates are only of indirect concern. Technique failure rates that increased monotonically with calendar period would have supplied evidence in favor of this hypothesis. However, since technique failure rates not only failed to increase at all, let alone monotonically, and actually were significantly decreased between 1986 and 1989, it is implausible that the decrease in PD mortality was an artifact due to simultaneous trends in technique failure patterns. Not surprisingly, in light of the above information, an ITT analysis of our data yielded very similar results to the those from the AT models. To summarize, a spurious PD mortality reduction could, in theory, have resulted from simultaneous trends in modality switching patterns or the statistical methods used in the analysis. However, our data offer no support for this hypothesis. Reasons for the decrease in covariable-adjusted PD mortality rates observed in the current investigation are unclear, but could very well related to practice patterns. Possibilities include increased dose of dialysis, increased erythropoietin utilization, improved nutrition, reduced peritonitis rates, increased patient compliance, better management of comborbid conditions, and earlier patient referral. Based on our cause-specific mortality results, deaths attributable to peritonitis were significantly reduced. The mortality gradient was much stronger for peritonitis compared to all-cause mortality, and is likely due to widespread adoption of the y-connector (25), which has been associated with marked infection rate reductions (26,27), and double-bag. A limitation of our AT analysis in this particular setting is that PD patients who switch to HD due to a peritonitis episode, and die from that episode while receiving HD, would not have their person-years or death (i.e., follow-up subsequent to the date of modality switch) counted, since only person-time on PD contributes to PD mortality rates. To remedy this shortcoming, the peritonitis mortality models were refitted with all peritonitis-attributable deaths among PD patients counted against PD, even if the patient was receiving HD at the time of death. The resulting RR values closely approximated those from the original model (data not shown). However, since peritonitis accounted for less than 3% of total deaths, the all-cause mortality trend observed in our investigation certainly cannot be reconciled by peritonitis reduction alone. A complete evaluation of peritonitis rates, technique survival, and related quantities is indicated, and will provide the basis for future analysis. Increased dose of dialysis would be expected to have the greatest impact on patients for whom the previous standard of 4× 2 L daily was inadequate. However, patient weight data were only available in the CORR database from 1994 onward. As discussed by Moran (17), our data predate widespread concern regarding PD adequacy, much of which was spawned by the CANUSA study (28). Assuming that our results are truly independent of systematic changes in dose, future decreases in PD mortality can be anticipated in light of a recent report by Blake et al. (29) indicating large increases in PD dose. Naturally, the greatest limitation of our investigation is that we are unable to determine what is causing the reduction in PD mortality rates. Due to lack of data on dialysis adequacy, patient compliance, nutritional status, and other factors that could be responsible for the decrease, we can only speculate on which technical improvements and elements of patient management have caused the decrease. Data on these factors are unavailable from the CORR database. Moreover, little has been published on practice patterns in Canada, let alone how these factors have changed over time. We have demonstrated a significant decrease in mortality on PD in Canada between 1981 and 1997. It is generally known that PD practice patterns have changed in Canada and other countries, although the magnitude of such changes is not well described. In the future, the nephrology community should aim to more precisely document RRT practice patterns, preferably through systematic prospective data collection. This would lead to more complete understanding of the relative importance of the various factors that reportedly influence clinical outcomes on RRT, which would ultimately result in further mortality reduction. This investigation was funded by Baxter Healthcare Corp., Renal Division (Deerfield, IL). The authors thank Dr. John Moran, who initiated the work, and Dr. Edward Vonesh for insightful comments on a draft version of the manuscript. The collection of data and the maintenance of the Canadian Organ Replacement Register (CORR) are made possible by the wholehearted collaboration of the 86 individual renal programs throughout Canada. The contribution of the current and past full-time staff assigned to the Register at the Canadian Institute for Health Information (formerly, Hospital Medical Records Institute) also has been essential to the success of the Register. The Canadian Society of Nephrology, The Canadian Transplant Society, and the Canadian Association of Nephrology nurses and technicians and their constituent members also have made an essential contribution to the Register since its inception in 1981. CORR is funded 15% by the federal department of health, and 80% by the provincial and territorial departments of health based on population. Together, the Kidney Foundation of Canada and the health care industry provide approximately 5% of the funding.